Planting canola deeper than 2.5 cm reduced overall establishment in 2012; however grain yield was generally affected to a smaller degree. Where planting into moisture below the optimum seeding depth (>2.5 cm), use large seed (minimum 5 g per 1000 seeds), avoid high rates of fertiliser in direct contact with the seed and avoid high stubble loads. Hybrids generally have larger seed than open pollinated varieties. Relatively large seed will generally have better establishment than relatively small seed. Seeding rates should be based on target plant population and seed size rather than applying a blanket sowing rate (in kg/ha), particularly given the large differences in seed size between varieties. In 2012 trials, hybrids generally displayed yield and farming system benefits over open pollinated varieties. Hybrid canola production has increased markedly in recent seasons, due largely to improved early vigour and higher grain yield potential relative to open-pollinated varieties. Hybrid seed generally retails for a higher cost than open-pollinated varieties, which is mainly due to the higher cost of seed production, as producing hybrid seed involves production of seeds of the parent lines in the first step and then the F1 hybrid in the second step. The yield and vigour advantage of hybrids is known as heterosis. Hybrids can be either GM or non-GM, and are now available in each of the four commercially available canola herbicide tolerance groups. For optimum yields in the Northern grains region, canola needs to be sown in the period from mid-late April to mid-May. This presents a challenge as this period is often dry and warm. Although the surface soil may be dry (top 3 cm), there is often residual moisture from summer rain below the soil surface. While it is generally accepted that canola establishes best when sown into a moist seedbed at a depth of about 2 cm, such conditions are rarely available in cropping zones of the Northern grains region. In 2012 trials were conducted across northern NSW to investigate the effect of sowing depth, fertiliser rate and retained stubble on the establishment of several hybrid and open pollinated canola varieties. The trial results reported here are broadly reported in two separate groups; northern and central-west. The northern trials were conducted at Moree and Blackville, while the central-west trials were conducted at Nyngan, Trangie and Coonamble. In addition to the field trials a glasshouse trial conducted at Tamworth was designed to determine if any establishment differences was due to variety choice, plant type (hybrid v O.P.) or seed size. All trials were sown with 60 kg/ha Granulock® Supreme Z (11 % N, 22 % P, 4 % S and 1 % Zn). The Nyngan and Coonamble trials were sown with a Janke parallelogram planter. Trangie was sown with a Morris Contour Drill planter. The Coonamble site was sown on a red/brown alluvial soil. The trial was planted on 21 April with 15 mm of rain on 3 May. The Nyngan site was sown on a red loam soil. The trial was planted on 17 April with 8 mm rain on 3 May. The Trangie site was at Trangie Agricultural Research Centre on a grey vertosol soil. The trial was planted on 20 April with 14 mm of rain on 3 May. Each trial had six varieties with a range in seed size (Table 1). Target seeding depths were 2.5 cm, 5 cm and 7.5 cm. Plant counts were conducted in mid May, which was two weeks after post-sowing rain at each site. Averaged across all trials and varieties, establishment at the 2.5 cm seeding depth was approximately 66% (Figure 1). All varieties had significantly reduced establishment at the 5 cm sowing depth compared to the 2.5 cm sowing depth, with the exception of Pioneer 44Y84 (CL). Compared to the 2.5 cm sowing depth, establishment of AV-Garnet and ATR-Stingray was reduced by 40 % at the 5 cm sowing depth. The 7.5 cm sowing depth had reduced establishment compared with both the 2.5 cm and 5 cm sowing depth for all varieties. 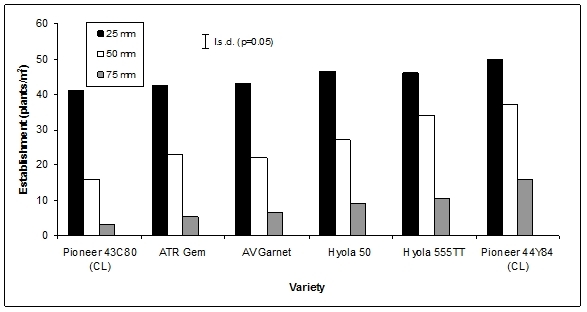 Compared to the 2.5 cm sowing depth, establishment of AV-Garnet and ATR-Stingray was reduced by 70 % whereas establishment of Hyola 555TT and Pioneer 43Y85 (CL) was reduced by 60 %. The reduced establishment from deep sowing was much less in Pioneer 44Y84 (CL), which only had a 30 % reduction at 7.5 cm compared to the 2.5 cm sowing depth and was still able to establish 50 % of total seeds sown at this sowing depth. Establishment of the different varieties at the deeper sowing depths was related to seed size, with Pioneer 44Y84 (CL) having the largest seed of the varieties in these trials. At Trangie on the vertosol soil, the effect of deep sowing was less marked than on the red soils of Coonamble and Nyngan. The effect of sowing depth on yield was less than the effect on establishment. At Nyngan and Coonamble, the 7.5 cm sowing depth yielded on average 250 kg/ha less than the 2.5 cm and 5 cm sowing depths. However, at Nyngan, Pioneer 44Y84 (CL) had no yield reduction at the 7.5 cm target sowing depth compared with the shallower sowing depths. There was no effect of sowing depth on yield at Trangie. Pioneer 44Y84 (CL) was the highest yielding variety in each of the trials, with average yield (across all treatments) of 2.1 t/ha. ATR Stingray was the lowest yielding variety in each of the trials, with average yield (across all treatments) of 0.9 t/ha. The northern trials were planted with a Janke parallelogram planter. The Blackville trial was planted into a black vertosol soil and had one planting date of 16 May. The Moree trial was planted into a grey vertosol soil and had two planting dates; 1 May and 22 May. Results were similar at both sites and similar for both sowing times at Moree, so are reported as an average of the two trials. Each trial had six varieties with a range in seed size (Table 2). Target seeding depths were 2.5 cm, 5 cm and 7.5 cm. Plant establishment counts were taken 16 – 24 days after planting. For both northern trials, establishment was highest at the 2.5 cm target sowing depth (Figure 2). Increasing planting depth from 2.5 cm to 5 cm significantly reduced plant establishment of all varieties by an average of 45 %. Pioneer 44Y84 (CL) and Hyola 555TT had higher establishment at the 5 cm sowing depth than all other varieties. Increasing the sowing depth from 5 cm to 7.5 cm resulted in the lowest establishment for all varieties, reducing establishment by an average of 81 % compared with the 2.5 cm sowing depth. Pioneer 44Y84 (CL) had significantly higher establishment than all other varieties at the deepest sowing (7.5 cm). Pioneer 44Y84 (CL) established on average 16 plants/m² at the 7.5 cm sowing depth, compared with Pioneer 43C80 (CL), ATR-Gem and AV-Garnet which established 3, 5 and 6 plants/m², respectively. There was no consistent yield reduction when sowing depth was increased from 2.5 cm to 5 cm; however the yield loss at the 7.5 cm sowing depth compared with the 2.5 cm sowing depth was 0.35 t/ha, averaged across all varieties. Pioneer 44Y84 (CL) was on average the highest yielding variety, with an average yield of 1.5 t/ha. This compares with the next best lines Hyola 50 and Hyola 555TT which averaged 1.2 t/ha. Pioneer 43C80 (CL) and ATR Gem had an average yield of 0.8 t/ha. The trials support the general recommendation of a planting depth of 2.5 cm for canola where conditions allow. However, these trials also show that where the soil surface is dry but moisture is available below 2.5cm, it is possible to establish a commercially acceptable population by sowing deeper. In these trials, Pioneer 44Y84 (CL) was the standout variety, but also had the largest seed of all the varieties sown. Hybrids in general had higher establishment than open-pollinated lines. At Blackville a plus stubble (wheat stubble 6.2 t/ha) and minus stubble treatment (burnt) was imposed across all sowing depths. The burnt stubble treatments resulted in significantly improved establishment compared with the stubble retained treatments at all sowing depths (Figure 3). This increase in establishment percentage of the burnt stubble treatments compared with the stubble retained treatments was 23, 35 and 60% at the 2.5, 5 and 7.5 cm depths, respectively. To determine if improved establishment is related to the hybrid trait or simply seed size the seed of each variety was graded into two size categories; large (2 - 2.4 mm diameter) and small (1. – 1.4 mm diameter). Twenty seeds of each variety and seed size category were sown at depths of 2.5, 5 and 7.5 cm in pots and placed in the glasshouse. Similar to the field trial results the 2.5 cm planting depth had the highest establishment percentage and increasing planting depth to 5 and 7.5 cm significantly reduced establishment by 32 and 51% respectively, averaged across all varieties. The small seeded OP treatment had the poorest establishment for each planting depth (Table 3); however, all treatments took a similar time to emerge from each of the respective planting depths. The large seeded hybrid and OP treatments had significantly better establishment compared to their respective small seeded treatments at both the 5 cm and 7.5 cm planting depths. Small seeded hybrids had significantly better establishment than the small seeded OP varieties (Table 3.). The establishment data suggests that large seed as well as the heterosis advantage of hybrids contributes to improved establishment. Dry matter of 100 plants was measured 15 days after emergence to give an indication of early plant vigour. The large seeded hybrids had the greatest dry matter accumulation at all sowing depths. Compared with the large seed treatments, the small seeded treatments (hybrid and OP) accumulated less dry matter and had a greater reduction in establishment where planting depth was increased. The early vigour advantage hybrids displayed over OP varieties that was observed for the large seed treatments was not observed for the small seeded treatments with hybrid and OP varieties accumulating similar quantities of dry matter per plant. These glasshouse findings indicate that the establishment and early vigour advantage of hybrids is mostly due to their larger seed size, but also partly due to the heterosis advantage of hybrid breeding. Table 3: Plant establishment, days to emergence and 100 plant weights (15 days after emergence) for 3 hybrids (44Y84 (CL), Hyola 50 and Hyola 555TT) and 3 open pollinated (43C80 (CL), AV-Garnet and ATR-Gem ) canola varieties segregated into large and small seed sown at 3 planting depths. **Numbers within each section (e.g. Establishment) designated with a different letter are significantly (P=0.05) different. At each of the central-west trial sites a phosphorus rate trial was also sown. Four varieties were sown in these trials; Pioneer 43Y85 (CL), Pioneer 43C80 (CL), Hyola 555TT and ATR-Stingray. The phosphorus product used was triple super which does not supply any nitrogen. The phosphorus rates applied were 0, 5, 10 and 20 kg/ha, with the fertiliser being placed directly with the seed. 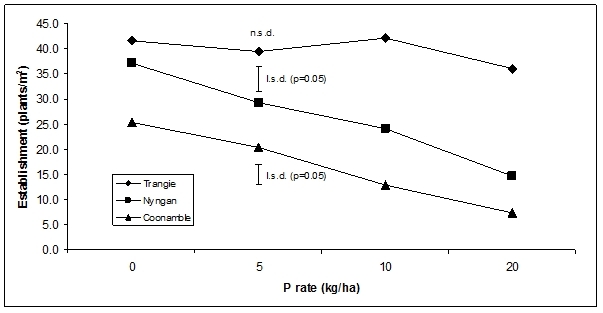 At Coonamble (Colwell P = 72 ppm), increasing the rate of phosphorus actually reduced yield from 1.5 t/ha at 0 kg/ha P to 0.9 t/ha at 20 kg/ha P. This was likely due to the reduced plant population as a result of unspecified fertiliser effects and an increase in weed pressure as a result of the poor establishment. At Nyngan (Colwell P = N/A) there was a significant yield increase of approximately 0.16 t/ha where 5 kg/ha P was applied compared to 0 kg/ha P, with no further increase beyond 5 kg/ha P. At Trangie (Colwell P = 22 ppm), the 10 and 20 kg/ha P rates yielded significantly more than the 0 kg/ha P rate (0.14 t/ha). These trials indicate that the amount of phosphorus applied in direct contact with the seed needs to be minimised. Where high phosphorus rates are required it is recommended to use a seeding system that separates the fertiliser from the seed. This paper reports only one season’s trial data; however, there are several consistent messages from the trials across the northern region. Increasing sowing depth of canola reduces establishment; however, the reduction is much less in large seeded hybrids e.g. Pioneer 44Y84 (CL). There is an effect of seed size both within varieties as well as between varieties. Varieties with inherently large seed size will establish better than varieties with inherently small seed size. Within a variety individual seeds that are large will establish better than small seeds. Where a hybrid and open pollinated variety have similar seed size, there still appears to be an establishment advantage from the hybrid. Increasing the phosphorus rate (as triple super in these trials) can also reduce establishment of canola, therefore it would be safe to assume that the combination of both deep sowing and high fertiliser rates would have a greater effect on establishment than where these factors are independent. Retained stubble, especially heavy stubble loads, was shown to be an additive effect and will reduce establishment regardless of sowing depth. The effect of deep sowing on grain yield is much less pronounced than the effect on establishment, therefore deeper sowing could be worth considering to ensure timely canola establishment. Across all trials, yield of hybrids was generally greater than the open-pollinated lines. Pioneer 44Y84 (CL) was the highest yielding line in the trials where it was included and Pioneer 43Y85 (CL) the highest yielding line where Pioneer 44Y84 (CL) was not included. Aim to sow canola to target 20-25 plants/m² in the Northern grain regions and western NSW, adjusting sowing rate based on seed size. Where seed needs to be placed deeper than optimum seeding depths (deeper than 2.5 cm), ensure that the seed is large (greater than 5 g/100 seeds) and that high rates of fertiliser in contact with the seed are avoided. High stubble loads will reduce establishment at all sowing depths. Hybrids had significant farming system (establishment and vigour) and yield benefits in the trials conducted in 2012. The assistance of Gavin Melville (statistical analysis), Jayne Jenkins, Robert Pither, Rod Bambach, Stephen Morphett, Jim Perfrement, Patrick Mortell and Jan Hosking (technical assistance) in the conduct of these trials as well as review comments by Don McCaffery – Technical Specialist (Pulses and Oilseeds) is gratefully acknowledged. We also gratefully acknowledge the farmer co-operators: the Dixon family, ‘Gilgi’ Coonamble; the Wass family, ‘The Plains’ Nyngan; Paul and Charles Tattum, ‘Bonniedoon’ Moree; Joe Fleming, ‘Parraweena’ Blackville. Varieties displaying this symbol beside them are protected under the Plant Breeders Rights Act 1994.